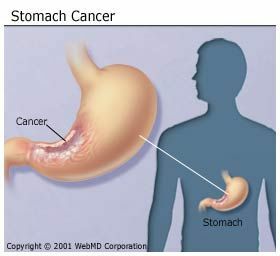 Cancer of the stomach, or gastric cancer, is a disease in which stomach cells become malignant (cancerous) and grow out of control, forming a tumor. Almost all stomach cancers (about 95%) start in the glandular tissue that lines the stomach. The tumor may spread along the stomach wall or may grow directly through the wall and shed cells into the bloodstream or lymphatic system. Once beyond the stomach, cancer can spread to other organs. Stomach cancers are classified according to the type of tissue in which they originate. Adenocarcinomas -- the most common -- start in the glandular stomach lining. Lymphomas develop from lymphocytes, a type of blood cell involved in the immune system. Sarcomas involve the connective tissue (muscle, fat, or blood vessels). Other types include carcinoid, small cell carcinoma, and squamous cell carcinoma. Metastatic cancers from breast cancer, melanoma, and other primary sites of cancer are also seen in the stomach. The number of stomach cancer cases has declined over the past 60 years. Even though it is not among the most common cancers in the U.S., it is still a leading cause of cancer deaths in other parts of the world. The exact cause of stomach cancer is unknown, but most are believed to result from exposure to carcinogens (various cancer-causing agents), especially nitrates. Nitrates are substances found in prepared foods (especially meats) that are dried, smoked, salted, or pickled. Carcinogens cause errors in the genetic code that controls growth and repair of cells. Helicobacter pylori (H. pylori) infection of the stomach lining is associated with gastric lymphoma and adenocarcinoma. H. pylori is a bacterium that infects the lining of the stomach and causes chronic inflammation and ulcers. The risk of developing cancer, in the presence of an infection with this bacteria is low. This bacterium can be found in up to two-thirds of the world’s population. In persons infected with this bacterium, the risk of developing gastric cancer is thought to be up to six times that of non-infected persons. There is an increased risk of stomach cancer in people who use tobacco or drink alcoholic beverages regularly. People who work in certain industries are also at greater risk. This includes those in the coal mining, metal, and rubber industries. Stomach cancer is most often seen in people in their late 60s through 80s. It is more common in Japan, Korea, parts of Eastern Europe, and Latin America than in the U.S. and Canada. This is thought to be related to the common diet in these countries, which consists of nitrate-containing, salted foods -- especially meat and fish. Stomach cancer can be associated with long-term survival if it is found and treated at an early stage. However, it is usually diagnosed at a later stage. Unfortunately, the outlook is poor if the cancer is already advanced. American Academy of Family Physicians: "What Should I Know About Stomach Cancer?" The Journal of the American Medical Association, January 14, 2004.